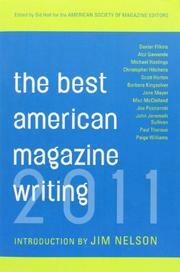 More reliably solid, educational reading material awarded by the American Society of Magazine Editors. Covering a variety of topics and interests, reporting merit was just one of the subjects judged for literary noteworthiness. Michael Hastings skewered hardheaded four-star Army general Stanley McChrystal with such eagle-eyed scrutiny in “The Runaway General” (Rolling Stone) that it actually prompted the official’s resignation. In another standout, “Covert Operations” (New Yorker), Jane Mayer offers scathing analysis of Charles and David Koch, a duo of wealthy, manipulative libertarians powering what Mayer describes as an unscrupulous political machine. The profile pieces offer lighter fare. Top honors goes to New York Times reporter Mark Liebovich’s profile of Mike Allen, one of America’s most influentially well-connected (and sleep-deprived) political news reporters. Jonathan Van Meter respectfully nods to his longtime comedienne comrade in “Joan Rivers Always Knew She Was Funny” (New York), as does Jonah Weiner in “Kanye West Has a Goblet” (Slate), a slickly written perusal of the grandiose rapper. There’s witty dispatches in Paige Williams’ Bikram yoga class discussion “My Bra’s Too Tight and It’s Never Too Late” (O, The Oprah Magazine) and an outstanding three-part piece from distinguished British author Christopher Hitchens on his battle with esophageal cancer in “Topic of Cancer and Unanswerable Prayers and Miss Manners and the Big C” (Vanity Fair). Elsewhere, Joel Brouwer’s thoughtful verse “Lines from the Reports of the Investigative Committees” (Poetry) succinctly illustrates the enormity of the BP oil spill in the same way Barbara Kingsolver’s eloquent short essay “Water Is Life” (National Geographic) beautifully underscores the vital benefits of Earth’s most precious natural resource. From serious to sublime, there’s a bounty of periodical perfection here.